Hi I am new to this website, so I will give you a bit of my history. I bought my CLK in July 12, it had some issues that this great site helped with and am hoping you can now. Carry out function test found time out fault with switch S84/15. Found switch latching to ram broken. Pump not running, tested voltage at fuse 13 rear fuse box voltage present. Fuse box contact for fuse 13 terminal 30 burnt contact. Switch 84/15 abd fuse 12 terminal 30 contact require replacement. Now to get this fixed it will cost another $1450.00 and I have to wait for the part to shipped in from Singapore, I live in Australia. My question is this a hard fix, can anyone tell me where this switch is and can I buy one direct from somewhere. 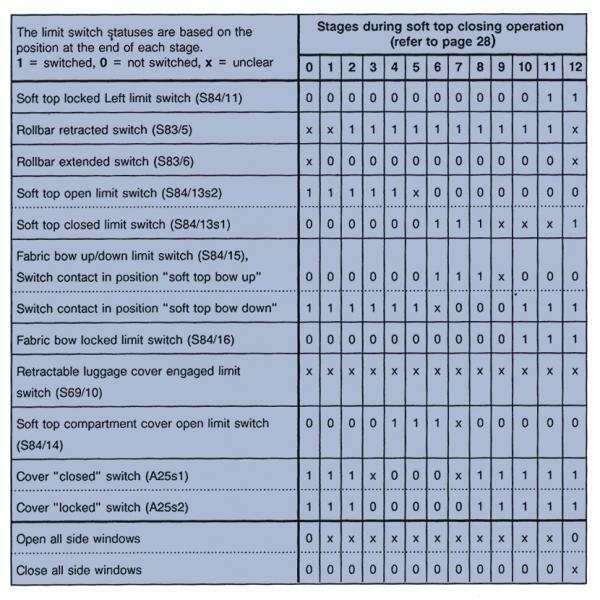 In a prior post, I included a WIS .pfd that shows all the electrical components and locations associated with the top operation. Last edited by Serndipity; 11-06-2013 at 07:53 AM. thank you for quoting the dealer's statement about the diagnostic work. The important part is them finding the time-out on the switch S84/15. $330 for coming up with their findings is not cheap, but there is a bunch of time involved in getting access to the relay. I do not understand why they say the pump wouldn't run after bridging the relay - we need to look into this some more together. It sounds like your system was partially working - is that correct? Did it blow any 40A fuses before? What did and didn't work on the top - where did it stop in the cycle? 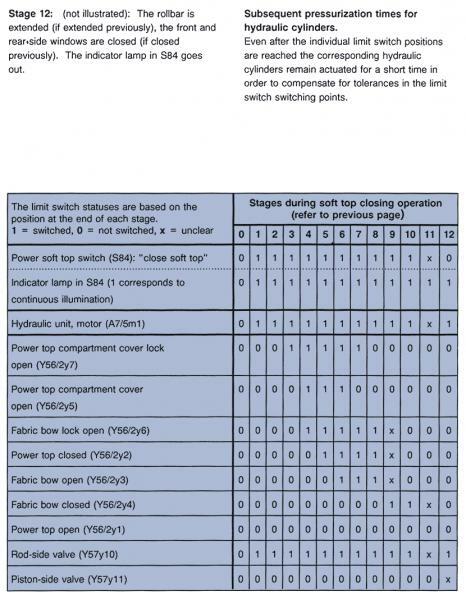 "Carry out function test found time out fault with switch S84/15. Found switch latching to ram broken." 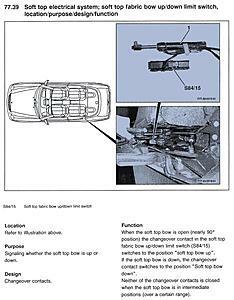 Switch 84/15 is the "soft top bow open/closed switch", which is attached to the left bow cylinder 2088000172. I don't know exactly how frequently these switches break, and why, but this is definitely not a first. P/n 2088202310. You should be able to buy it online. However, I would hold off on replacing this switch until you have checked a few more things. It may have timed out because the pump wasn't able to lift the bow up far enough. Fuse box contact for fuse 13 (typo?) terminal 30 burnt contact. 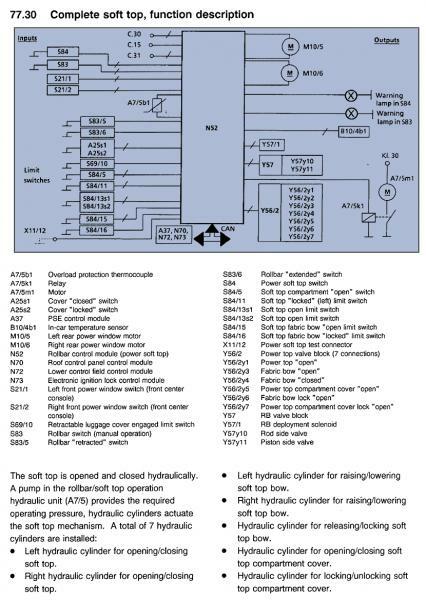 Switch 84/15 abd fuse 12 (typo?) terminal 30 contact require replacement. There is something missing here. If their recommendation is only to replace the switch, the fuse contact, and the pump relay, then this should not cost $1450. Maybe the replacement contact is golden. Do you have a written copy of their cost estimate, leading to $1450? I am not saying that the dealer is cheating - just need to understand this better. Furthermore, it is not clear to me that everything will be okay after these parts have been replaced. It is not clear from their description exactly how much they have tested. The underlying problem could still be a high current draw from the pump. Let's take this in bite-sized chunks, and you can actually take care of everything or most of it with a little determination. 2) Get at least a couple of spare 40A fuses. Clean up the burnt contact (to the 40A fuse) they are referring to. It may not need to be replaced unless you are a total perfectionist. 3) If the pump will not run at all at this point, then please report back and I will walk you through jumping the relay at the pump for further DIY diagnosis. 4) If the pump is running well, then make sure that the pump is lifting the rear bow (rear window) all the way, since their diagnostics said the system had timed out waiting for the proper signal from switch 84/15. Check for obstacles, take a look at the switch itself, and check out the wiring around it for anything obvious. If all seems well then follow their recommendation about replacing the switch. That seems to be p/n 2088202310 - I would recommend double checking with the dealer that this is the correct p/n because it is not cheap. The list price in the US seems to be $144, and you can find a used one on eBay. The switch just clamps onto the left bow cylinder. 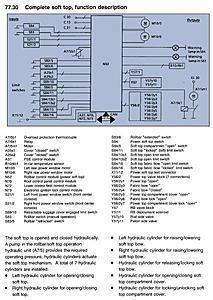 it is awesome that you previously posted a WIS pdf with all the electrical components and locations. Would you mind providing a link, or re-posting that pdf? With the number of helpful posts you are making, it would be cumbersome for anyone (and very difficult for newbies) to find that prior post of yours. 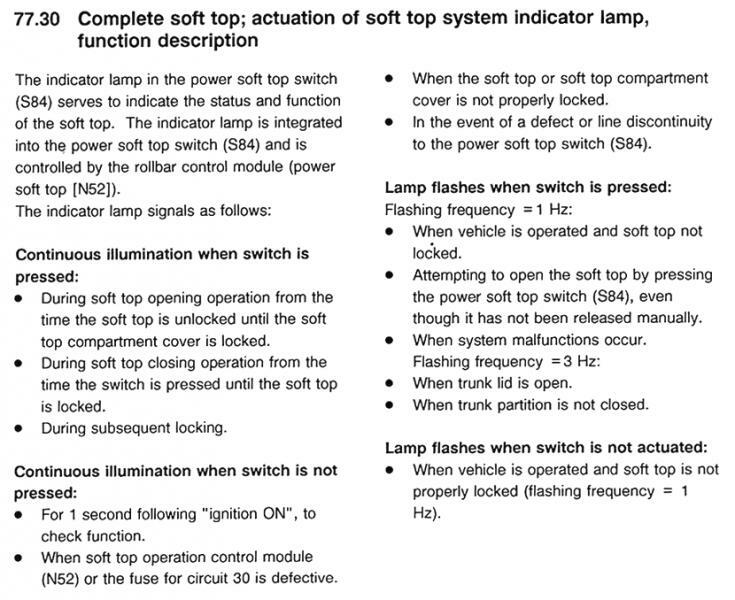 You are correct, S84 is the main soft top power switch. S84/15 is the one located on the left bow cylinder. Thankyou for your information, I quoted word for word what written up by the dealer, but I could scan the quote if required. 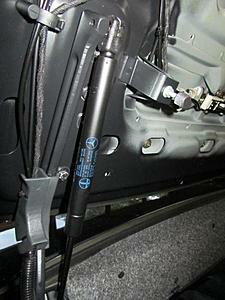 Answer to Q 2 - I will get some 40A fuses today and check, I will get back to you later today. Just a side note I have used your information in the past to fix the roof with other problems low fluid and of course the replacement of the rear bow lock, I would just like to really thankyou for all your help. could you clarify what is currently working on your top and what isn't? If it is working at all, where exactly does it stop in the cycle? I was unable to include the document in this thread because I had previously posted it in another thread. I just sent you the WIS document, as an attached file, using the contact window on your web site. Let me know if you did not receive it. 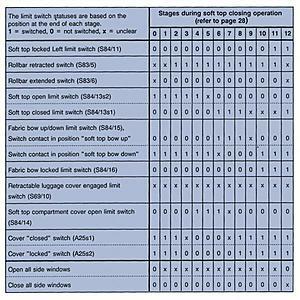 There are numerous S84 switches with the specific locations/functions indicated by the suffix. 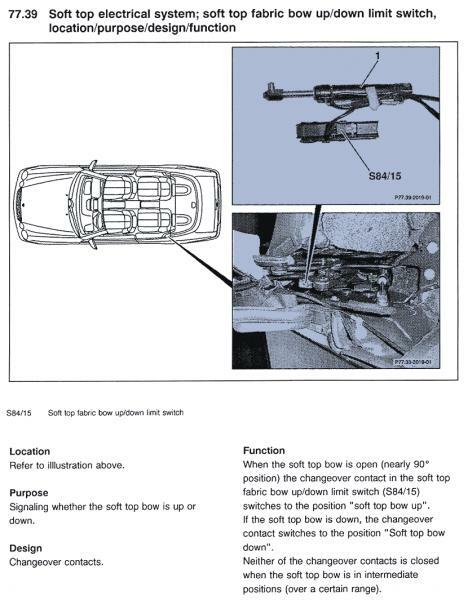 As you previously mentioned, the S84/15 is the 'soft top fabric bow up/down limit switch' associated with the soft top bow hydraulic (locking/unlocking) cylinder and is shown on page 9 of the document. As an owner of a cabrio, thank you for all the attention and help you have provided to this forum. So far my roof has performed flawlessly for 12 1/2 years, but it would probably be a good idea to acquaint myself of the pump motor/relay 'fuse' location (e.g. to quickly pull it in the event that the relay contacts weld shut). Last edited by Serndipity; 11-05-2013 at 06:51 PM. At the moment the roof does not do anything, the switch in the centre console lights up red when starting engine and when the car is put into gear I get a warning bell that lasts for about 10/15 sec then the switch flashes, also before I took it to the dealer the rear headrest would not go up and down now they do. I am going to get the 40 fuses soon I believe you mean the blade type? Hi all well I changed the 40A blade fuse started the car and tried the roof the rear bow lock opened sand the window section of the roof went up then nothing more, tried to close and got nothing stopped the car then restarted the roof shut I think it is the Limiting switch as stated by the dealer, what are your thoughts? Last edited by Serndipity; 11-06-2013 at 07:51 AM. that seems to be consistent with the dealer's diagnosis. 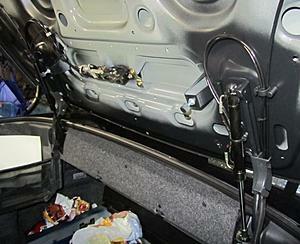 The rear window section (rear bow) is lifted by the bow cylinders A 208 800 01 72, and the left one has a switch on it that indicates whether the rear bow is up or down. 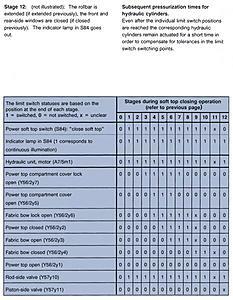 This is the aforementioned switch S84/15 p/n 2088202310 (aka A 208 820 23 10). If this switch does not signal the bow being up, then the controller will time out. Below is a picture of the switch mounted to the cylinder, taken off Australian eBay listing http://www.ebay.com.au/itm/2000-2003...item4ac1b242c1. Check out the switch first. Is yours fully attached, are there any broken parts on it, and can you check it out electrically? If possible, you want to check it out with a multimeter. 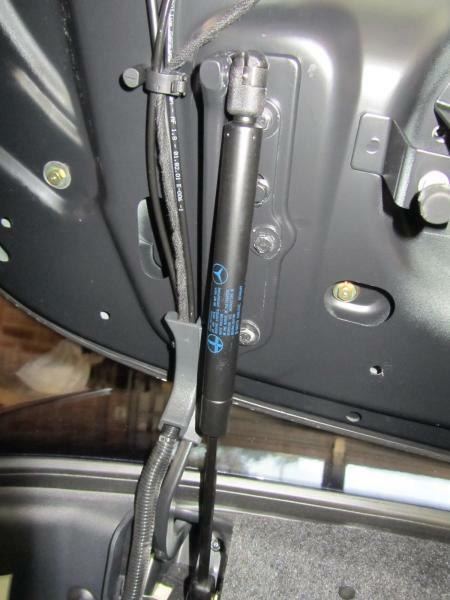 Measure the electrical resistance on the connector when the rear bow gets fully raised - does it change, i.e., does the switch work? I have attached some photos of the rear bow struts, could you please explain where the switch is as I went to the ebay list and can see the whole assembly but my gas struts dont seem to have the switch attached as per your photo. I cant even find the wiring. Am I looking in the wrong place. I am such a nucklehead I have found the switch after looking at Serendipity's post, I presume that you get access after removing the lining that the seatbelts come out of, sorry but can you tell me how to remove said lining. Thankyou Serendipity for the info, I just wanted to see if you can tell me how do I access the switch do I have to remove the lining and if so how do I remove the lining. 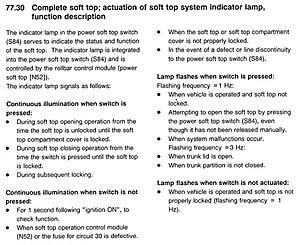 Enclosed is some additional information pertaining to the location/function of the S84/15 bow up/down limit switch. 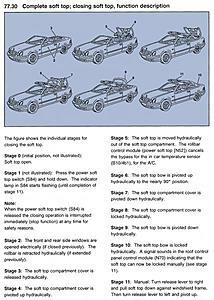 Enclosed is some additional information that will help diagnose and repair electrical switch problems encountered with the roof operation. Last edited by Serndipity; 11-18-2013 at 09:32 AM. Well I have finally fixed the roof, I bought a limit switch from American website for $150.00 Amer d and fitted it roof now works perfectly. Id just like to say thankyou all for your help. congratulations - it looks like you just saved some $1250 by consulting with the forum and replacing the relay p/n 0025421319 and the switch p/n 2088202310 yourself! You originally asked how hard it would be to replace the switch, and nobody had a direct answer. Can you share with the forum how much work it actually was to replace the switch S84/15 on your tonneau cover cylinder? Hi, guys can anyone help me out diagnosing why my roof wont go down? I only hear relays clicking. Is there anyone who can guide me? i have removed all carpets. 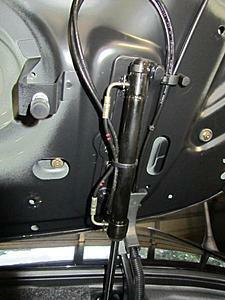 And can see the hydraulix motor. I was able to let go roof down manually. And i disconnected the roof ECU for few minutes and then connected back. and now windows wont go down. as well as when im driving red button is flashing. 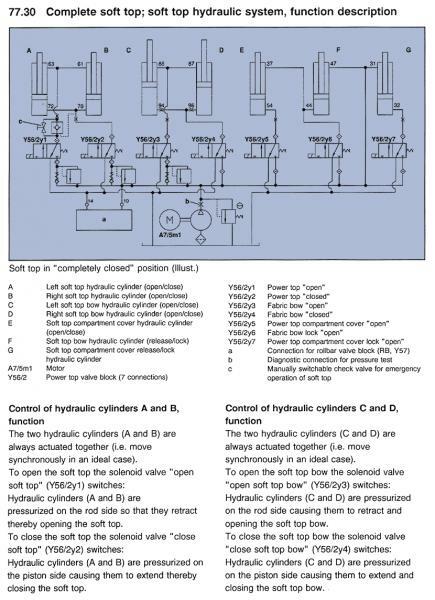 Any suggestions where to start and how to check hydraulic motor? Unfortunately your description is to vague. The power roof operation is quite complex, involves numerous interdependent conditions. Your best option would be have a dealer or qualified independent mechanic perform a STAR diagnostic to isolate the fault further. Then you can have the shop repair or if you're familiar with DIY methods and repairs, use the forum for help (e.g. the forum search capability will provide a lot of information regarding troubleshooting and repair). Hello again, I will describe everything in more details. I live in Lithuania and private garages here are sometimes better than a dealer who will rip off for nothing. Heard many stories like this. I feel i can do this on my own with the help from people who have gone through this. Now to begin with. I have purchased this W208 with a not working roof. head rests were working fine, up and down no problem. But the sound of the motor was quite noisy. But one time i pressed headrest s to go up and sound was very silent, i thought maybe it has fixed itself. 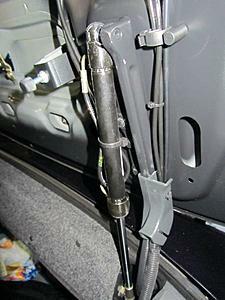 But then headrests stopped working and i only hear relay click. When i press the roof to go down - only windows go down. and red button blinks. Blinking stopped after i pressed the sensor in the luggage compartment. 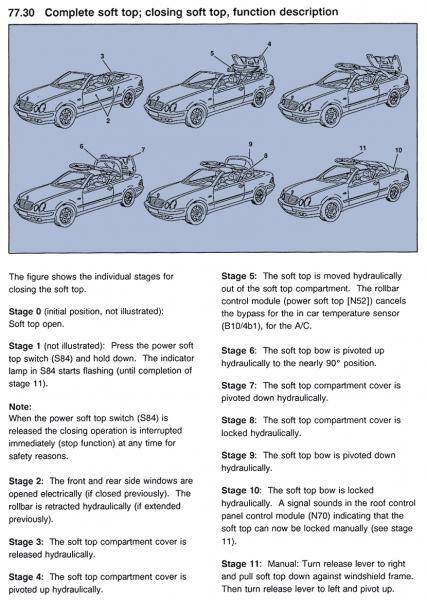 Also i checked sensor on the trunk lid which opens the soft top - it also is fine, because when i clicked that sensor - the trunk open button wont work cause i think car thinks soft top is open and wont allow trunk to open. Also i have check the sensor on the wall behind the passenger. It also seems ok. All fuses i checked under the hood and under the trunk. All are fine. I have removed all carpets now. and have good access to motor. Next step i think would be good to provide 12v directly to motor. This way id know if its fine. Klaus, i hope that was detail enough. Let me know if i can provide more info. Thanks! Ok this morning i drove a car, and red button started blinking as well as beeping for 5 sec. when starting to drive. Sensor in luggage compartment is fine. I wonder what else triggers this. I believe you're referring to the rear seat headrests (a.k.a. roll bar). Perhaps post #4, at the link below, which details its operation, will help troubleshoot the problem. 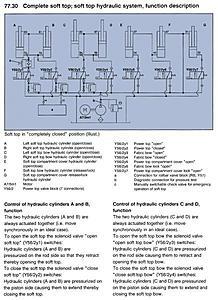 Thank you, im studying those diagram now. I believe it may be a motor problem...Need to check it first i guess.